Walmart Selling Black Lives Matter Gear? When I heard that Walmart was selling Black Lives Matter gear, I actually didn’t believe it. So I decided to verify the information for myself. 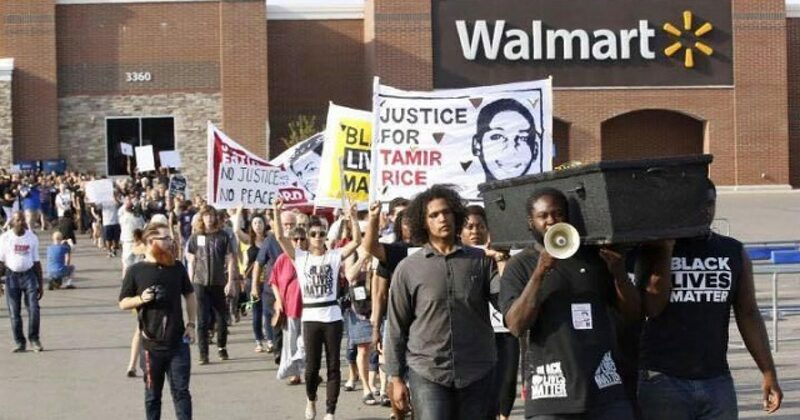 And yes, Walmart indeed sells Black Lives Matter gear, thus proving it too will do will do anything to make a buck. It would be one thing if it was about making money, as deplorable as that is. But let’s face it, there are many black Liberals who know that Black Lives Matter is racist nonsense. They know that to support Black Lives Matter is to support terror. Nonetheless, that doesn’t stop them from making a few dollars on this nonsense. Look at all the people who were selling Trayvon Martin gear, including Obama offering his own hoodie. A lot has been made about the hoodie lately. Not only has Geraldo partially blamed it for the death of Trayvon Martin, but it’s also become a symbol of unity for standing with the slain teen and his family. So when the Obama camp announced via Twitter yesterday that it was putting its 2012 hoodies on sale, it got some thinking: Is the President trying to capitalize off the death of Martin? I can only imagine what’s in that planner. Others show “Black Lives Matter” with a fist in the air. Walmart’s support for this racist terror group amazes me, in that they had a very different reaction to All Lives Matter. For the past nine months Domagron, a family-owned business, has been selling “All Lives Matter” bumper stickers on Walmart’s online marketplace. But on Oct. 11 the company received a notice from the nation’s largest retailer that the bumper sticker had been removed from its marketplace. The notice implied that the bumper sticker had violated the company’s “prohibited products” policy. Just so we are clear, Walmart believes black lives matter more than ALL lives. I hope that millions of Americans remind Walmart that ALL lives matter, particularly when it comes to where we choose to shop.